1). Elwell-Parker, Limited. Employing 400 people with a large order-book. 2). The Electrical Power Storage Company Limited, and their Millwall factory, together with the company's many electrical power storage patents. 3). The Railway Electrical Contractors Limited, and their patents and contracts for train lighting. 4). The Julien Patents for Electric Traction, the Sprague Patents for Electrical Traction and the Transmission of Power. The starting Capital of the Corporation was £500,000 in 50,000 shares of £10 each. Numbers 1 to 100 inclusive were Founder’s Shares. The new concern was incorporated on 7th June, 1889, and it was decided to build a new works on the land already purchased by Elwell-Parker at Bushbury, along with some adjacent land. The new works were erected at a cost of £10,000 on the 24.5 acre site. When the building work was complete, the staff and machinery from Commercial Road were moved to the new site. On 16th June, 1890 the Commercial Road factory was sold to the Electric Construction Corporation. Presumably the E.C.C. continued to use the works for some time, as the factory remained in the company's ownership until 12th March, 1895 when the buildings were sold to Thomas Brotherton and Francis Simms. 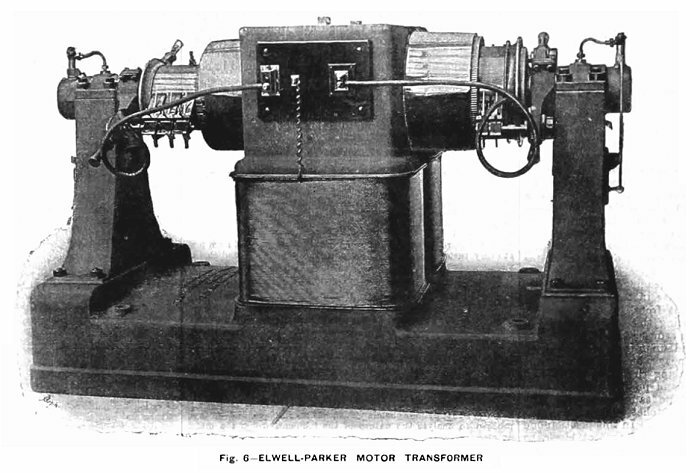 Elwell-Parker machinery can be found in every civilised country in the world, specially adapted to the requirements of the transmission of power and electro-chemical purposes. Elwell-Parker Limited is now part of a syndicate called the Electric Construction Corporation. The business of the firm recently assumed such immense proportions that it was found necessary to acquire more commodious premises in which to carry out the work of the concern. Land was acquired in Showell Road, Bushbury, and a new factory was built there. It is due to be completed next month and will employ a large number of people. There is one man above all others to whom the credit must be given for introducing and developing this trade, and raising Wolverhampton to a position of importance in the commercial world, which this town would otherwise not have attained, but for his skill and enterprise, and it is to Mr. Thomas Parker. It was resolved in 1887 to erect new premises in Bushbury, and a portion of the land was purchased for that purpose, however, when the concern was taken over by the present company, the Electric Construction Corporation, Limited, it was resolved to build on the site first proposed but on a larger scale. Employment is found in the present works for about 600 hands. Large orders are in hand, and work assured which will fully occupy the new works, and it is expected that 2,000 hands will soon be employed. In this concern Mr. Parker holds the position of chief engineer and works director. Honours have also been thrust upon him. In 1885 he was made a member of the Institution of Electrical Engineers, and in 1889 a member of the Institute of Civil Engineers. At the new works the machinery is bolted down into the concrete foundation and upper columns carrying the roof trusses have a specially designed head, which allows the rainwater from the roof to flow down the columns to a drain at the bottom. A siding from the L.N.W.R. is brought into the works, and runs across the shops at the top end, so that the electric overhead travelling cranes can deposit goods upon the trucks for removal from one shop to another, or for sending them away. There will be two 10 ton travelling cranes in a 45 ft. bay and two identical ones in the foundry. The remaining five bays of the main shop are fitted with 5 ton cranes worked in the same way. The siding is also taken to the foundry cupolas and boiler house. The office windows overlook the shops and yard and there is an enquiry and a timekeeper’s office in-between the workmen’s entrance and the main entrance, so that the timekeeper can see everyone who enters or leaves the premises. There are two waiting rooms for the offices, one for the works, and a consulting room adjoining Mr. Parker’s office. There are three large offices for the secretary, electrician and chief draughtsman. There is a strong room lined with fire brick and fitted with Chubbs’ patent fire and thief-proof door, which opens from the secretary’s office. There is a large board room, telephone room, storeroom and typewriter room close to the clerk’s desk. There is a photographic room for copying drawings, a pupil’s room, which is entered from the works, separate lavatories, a cloak room and a clerk’s dining room. The drawing office and clerk’s office are each 32ft. by 34ft. 6 inches and are partly lit from the roof. There is a corridor leading from the clerk’s office to the works so that instructions can be given to workmen and enquiries for drawings etc. can be made without disturbing the main office. A covered passage also leads from the offices to the warehouse. The engine house, which is 35ft. square and the boiler house, which is 78ft. by 45ft are built on the east side of the main shops. The boiler house is 7ft. 9 inches below the level of the main yard and contains seven Babcock and Wilcox boilers. Projecting from this and under the yard are coal bunkers with a siding passing over them so that coal can immediately be shot-down to the level of the boilers. The circular chimney stack is 120ft. high and 8ft. internal diameter at the bottom, tapering to 6ft. 8 inches internal diameter at the top, with a large moulded cast-iron cap. The laboratory, on the left-hand side of the gateway into Showell Road measures 56ft. 6 inches by 20ft. and consists of chemical and physical departments, separated by a glass screen. There is a small 20ft. by 10ft. room which is used for rough work and the storage of batteries. The laboratory has a number of porcelain sinks, specially designed tables and fume closets. The pattern shop and storeroom each measure 100ft. by 33ft. 6 inches and extend along Showell Road, just above the laboratory, and have suitable workbenches for the construction of patterns. The iron foundry measures 160ft. by 82ft. 2 inches and the brass foundry measures 62ft. 2inches by 40ft. They stand on the opposite side of the siding to the pattern shop and are similarly constructed to the large shops, with columns, girders and cranes etc. and have temporary ends so that they can be extended if required. Three large drying stoves are provided with specially designed furnaces and there are two of Thwaite’s patent rapid cupolas with a lift and charging platform, each capable of melting 5 tons per hour. The blacksmith’s shop, built alongside the iron foundry measures 84ft. by 30ft. and is designed for 12 forges, and the latrines and water tower and tank are built between the main shops and the foundry. The water tank is 20ft. 6 inches above the ground and holds 35,700 gallons. Water is pumped into it from the brook, which runs through the site. It will be used for supplying the boilers, sinks, lavatories etc. The mess rooms consist of two large dining rooms, one 70ft. by 40ft. for men and another 40ft. by 30ft. for women. In between is a kitchen, measuring 25ft. 3 inches by 32ft. 3 inches. It is fitted throughout by the Coalbrookdale Company, with a large range and grill, vegetable steamers, and a hot closet so that workpeople can bring their own food and have it warmed-up. There are lavatories on each side of the entrance and each person will have his or her own place and number with a coat-hook. The site occupies about 24 acres, with yards paved in tarmac covering about 4.25 acres. The bricks for the general work came from the Tibbington brickworks, the blue bricks came from Hockley Hall Company and the facing bricks for the offices and mess rooms were supplied by Messrs. Partridge and Company of Kingswinford. Over the main entrance to the offices is an ornamental clock tower, with stone dressings. The pilaster and moulded pediment over the entrance doors, and all exterior stonework are executed with white Hollington stone. The office roofing tiles were obtained from the Hockley Hall Company and the other roofing tiles are of best Bangor slate. A large proportion of the roofing area is glazed on the simplex system and the main shops are paved with patent granitic flooring. The laboratory floor is made of wooden blocks set on a concrete foundation and the office corridors are laid with Ebner’s Terrazzo Mosaic with a coloured glazed brick dado with moulded capping four feet high. Most offices are heated by open fireplaces, but the large drawing and clerk’s offices are warmed by hot water on a low pressure system, the boiler being placed in the basement in a separate room. The mess rooms are also heated on the same system. The large shops will be heated by the exhaust steam from the engines, carried in 4 inch pipes between the columns. An attempt was made to make Thomas Parker a director of the new concern6, but this was defeated and he had to be content with the post of Works Manager. The Corporation got off to an excellent start under the chairmanship of Sir Henry Mance. The works were operating at full capacity and orders flooded in, including a further order from the Birmingham tramways, following the successful running of the Elwell-Parker prototype. In the battery-powered vehicles, the accumulators were placed under the passenger's seats, and a portion of the gross profit was absorbed in the settlement of claims from passengers, whose clothing had been splashed by acid. 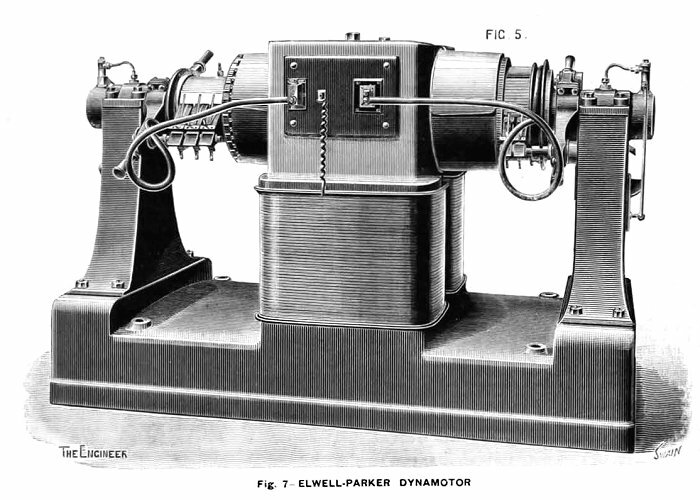 In 1890 two Elwell-Parker type dynamos were displayed at the Paris Exhibition. They were driven by two Crossley 'Otto' gas engines, and supplied power for lighting. One of the dynamos sent to the Paris Exhibition. 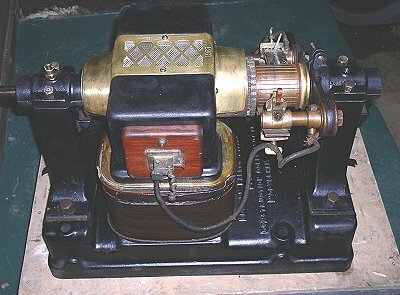 In 1890 another Elwell-Parker type dynamo was displayed at the Edinburgh International Exhibition on the Carrick and Ritchie stand. It was operated by a Carrick and Ritchie 'Waverley' water turbine. The firm supplied the turbines with the Elwell-Parker type dynamos for lighting installations in large houses or factories. Many of Thomas Parker's designs were ahead of their time. In the 1880's a number of power stations were built for electricity distribution. They all used D.C. because of the difficulties involved in running A.C. generators (alternators), in parallel. When a number of alternators are connected in parallel, each one must be synchronised to the others, so that all of the outputs are in phase. This was first achieved experimentally by Dr. Hopkinson in 1886, but was not put into practice until 1891. This is an essential requirement for modern electricity distribution. The first two installations using this technique were at Bournemouth, using Mordey alternators and at West Brompton using Parker machines. Another year passed before A.C. generation came into general use. In 1890 the E.C.C. granted a licence to the General Electric Power and Traction Company of Kentish Town, London for the use of its traction patents. The firm also agreed to supply the traction company with accumulators. By 1893 Thomas Parker was a director of the traction company. E.C.C. also developed an overhead-wire, tram system, which was put to use in 1893 when the company electrified the South Staffordshire Tramways and a little while later the Hartlepool tramway. Thomas Parker laid-down a section of tram-line at the works, which he hoped would be largely copied in London for direct tram-driving. The E.C.C. received another order for an 800 ampere-hour battery, for the Whitehall Court in London, followed by possibly the most important order at the time, for the electrification of the Liverpool Overhead Railway. This was the earliest and only example of an elevated electric railway in the country. The project was a great success, and in 1900 the company undertook the re-electrification of the City and London Railway. Another important order was the planning and installation of the Oxford Electric Company's Works, which was so successful that it became known as "The Oxford System" of electrical transmission. The E.C.C. specialised in direct current high tension, and their "Oxford System" included a central generating station, supplying 2,000 volts D.C. into sub-stations, where motor-generators stepped the voltage down to 200 volts. The same system using a central supply of 1,000 volts was used at Birmingham, Charing Cross, Chelsea, Sydenham and Shoreditch. The company also installed the electricity generation and transmission system for lighting at Burnley. The Crystal Palace Electrical Exhibition. The Engineer, 1st April, 1892. The present exhibition at the Crystal Palace will mark the successful operation of one of the most practical modern schemes for the distribution of electric current over wide areas. 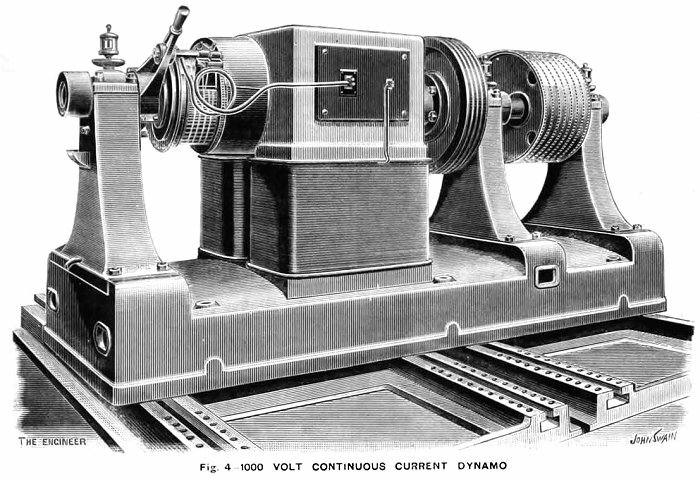 The continuous current transformer has here asserted itself, and proved that with carefully worked out details in construction, and in the system with which it is used, it is a most trustworthy and efficient means of securing the advantages of a high tension distribution with a continuous current supply. No undertakers who find themselves called upon to extend their low tension mains into remote suburban districts need fear that because they do not happen to be using alternating currents, they must either bear the cost of additional stations to feed the network or sink excessive amounts in mains. The entire system has been worked out on a practical basis by the Electric Construction Corporation of Wolverhampton under the guidance of Mr. Thomas Parker, the works director, and one of the most pleasing exhibits in the exhibition is to be found in the stand of this Corporation in the Machinery Court, containing as it does machines of such high-class construction, and controlling apparatus so well suited to the requirements of the system. The largest machine in this stand, Fig. 6, is a continuous current transformer or motor transformer, identical in size and output with the ten machines used inside the Palace for the supply of current to exhibitors. It is to be regretted that it was found necessary to fix these machines so far out of sight underneath the Palace, as otherwise their full display in operation would have considerably added to the practical interest of the exhibition. We have already explained the working of the machines in the Palace, which receive current at 1,000 volts pressure from the Crystal Palace and District Electric Supply Company’s Station at Sydenham, one and a quarter miles distant, and transform it down to a pressure of 110 volts for exhibitors. 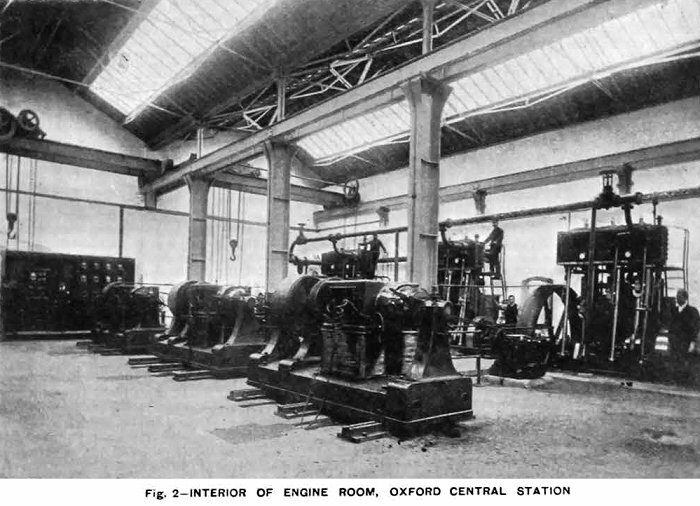 The complete system of distribution by these motor transformers for town lighting, as now adopted at Oxford, will be understood by reference to Fig. 7. In the first place there is the generating station, the site of which is selected with reference to good water supply and economical facilities for delivery of coal. In this station are installed the necessary engines and boilers, together with the electric generators and their exciters. As the area of lighting extends, more generators can be added, their manipulations in parallel being perfectly simple. These produce current at 1,000 volts pressure, which is delivered by all the machines on to one pair of bars in the station, known as omnibus bars, or shorter, bus bars. From these the current proceeds along the high tension mains to the most central point in the district of supply, at which is located a central switch station. From this station is controlled the working of all the transformers used in the system, these machines being located in sub-stations situated radially around the switch station at points most favourable for feeding the low tension network of supply, and keeping the electric pressure uniform throughout. At the switch station there is a pair of omnibus bars receiving the high tension current from the generating station, and from which the same current is, through double pole switches, connected onto the feeders supplying the motor transformers at the sub-stations. For the complete control of all the transformers only one man is required in the switch station. The voltmeters in this station show the pressure on the town supply network at all the sub-stations, and as the load increases in any district, the pressure is kept up by switching on an additional transformer located in that district. Although the sub-stations where the transformers are fixed are at various distances away from the switch station, the switching in or out of these machines controlled by one man at the above station with perfect certainty and ease. In performing this operation the first thing to do is to close the two-pole switch which conveys the high-tension current to the transformer. The current, which passes through a considerable resistance before leaving the station, passes into the armature of the machine on the high-tension side, and excites the field through a few turns of thick wire in series. The brushes on both commutators are kept permanently down, and need no alteration of lead for changes of load, as the reactions of the two armatures neutralise one another. Once the excitation of field is started, the machine starts, at first quickly, but the shunt field rapidly building up, the speed soon decreases again, and is then brought up to the required amount by reducing the main resistance in the switch station. So far the transformer is started, but the secondary winding on the armature is not yet put in connection to feed the supply mains. This is done at the switch station by the simple act of momentarily closing and opening a switch which short-circuits the voltmeter. This causes a current to flow through an automatic circuit closer fixed with each transformer in the sub-station. 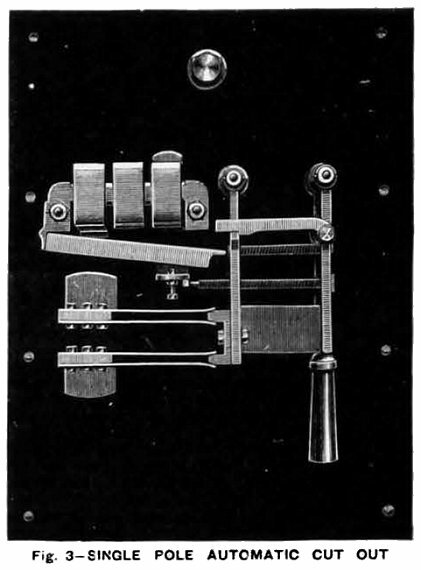 This apparatus, shown in the figure, consists primarily of an iron-clad electromagnet, the exciting coil of which is included in the circuit of the voltmeter at the switch station. The resistance being small does not interfere with the voltmeter readings, and, moreover, by short circuiting the voltmeter in the switch station for an instant, a large current from the supply mains flows through the coil, causing the armature of the magnet to be drawn up. The armature carries two pawls lying on a ratchet wheel, and upon its being attracted upwards, the left-hand pawl engages one tooth and moves the ratchet. Again, on breaking the short-circuit the armature falls, and the right-hand pawl engages, forcing the wheel round further in the same direction. The double operation moves the ratchet wheel and cam through one-eighth of a revolution. In this position one tooth of the cam bears down on the contact block, so completing the low tension circuit from the transformer to the mains. The load on the mains is equally divided between the transformers at work, but in case of short circuit or any accidental stoppage which would cause an undue rush of current into the machine, an automatic cut-out, shown at M is fixed in connection with the above apparatus. The armature of the electromagnet M would in such an event be drawn up and strike the cam, shifting it round and disengaging the tooth from the contact piece S, thus breaking the circuit. Similarly, as the load decreases, the various transformers can be severally disconnected from the supply by the operator at the switching station. Once closing and opening the voltmeter switch shifts the cam another eighth round, and allows the contact piece S to rise and break circuit. 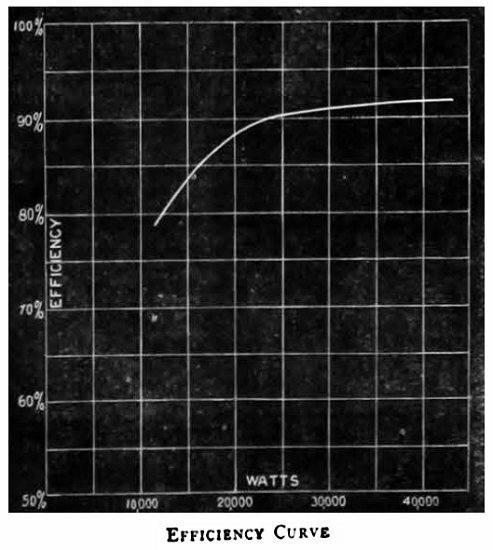 By this arrangement the transformers are only used as the load requires, and are therefore, for the greater part of the working time, near their full load; and as the efficiency of these machines reaches 92 percent when delivering their full load of 40 kilowatts, and 87 percent at half load, see curve, Fig. 8, it will be seen that the whole system is worked with great economy. The only regulation required in the generating station is the adjustment of the strength of exciting current supplied to the generators, the pressure, as indicated by a voltmeter on the omnibus bars in the station, being maintained constant by this means. The exciting current is regulated by resistance in the shunt field of the excitors, of which there is a separate machine for each generator. The Corporation have also carried out several important contracts in alternating current plant. 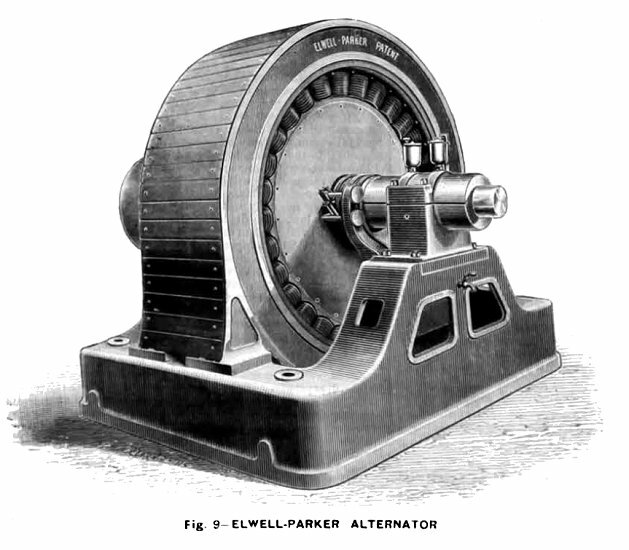 We illustrate the Elwell -Parker alternator, Fig. 9, of 80 kilowatts, as exhibited in operation at the Palace. The armature is a stationary external ring, built up of soft iron rings, to the inside surface of which are clamped the coils. The latter are twelve in number and composed of copper strip, the edges being placed radial to the machine. These are held by wooden clamps bolted round the ring on each side. The field magnet, with the same number of coils, mounted on cores and yoke of solid forged iron, rotates inside the armature. The machine being high-tension, the armature is externally cased-in with a wooden cover, and the terminals of the machine are protected under a portion of this cover, kept under lock and key. The wires leading from these terminals are also taken underneath the bed of the machine in casing through the concrete, so that complete immunity from danger is attained. Alternate current transformers of 2 and 4 horse power output are also shown in Fig. 10. These are of very simple construction, the two circuits being first bound together and afterwards encased around with soft iron plates made in the form of the letter L and built up on each side of the coils. The two rows of discs are then clamped together by bolts passing through cast iron end pieces. The Corporation also exhibit a new pattern of adjustable resistance, sets of cut-outs fitted in porcelain boxes, and a high tension automatic switch used in connection with the above transformers. Electric Lighting in Oxford. The Engineer, 1st July, 1892. 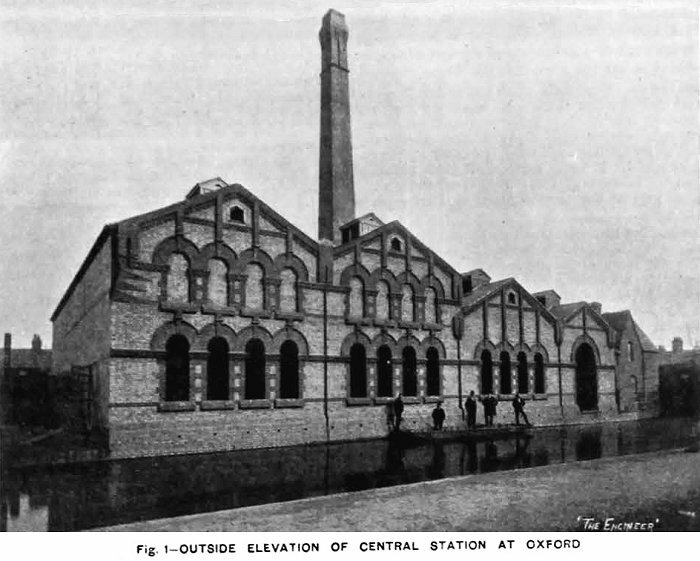 On Saturday, June 18th, the electric current was switched on for the first time to the City of Oxford, by the Oxford Electric Company, and a large party had been invited to a dinner given at the works in honour of the occasion. The arrangements were very satisfactorily made by Mr. George Offor, the secretary of the company. We have referred previously in our issue of April 1st last to some of the features of the system employed, and are now able to give a full description of the plant. It was found impossible to obtain a suitable piece of ground for the works near the centre of the city, a piece of land was therefore acquired at Osney upon the banks of the River Isis. The outside of the building, which are of a neat design in brick, is shown in Fig. 1. The interior of the engine room is shown in Fig. 2, from which it is evident that there is ample room for more plant. This position will enable the company to charge electric launches, which will be an important source of revenue, and the works are kept away from the better parts the town. The system adopted is that of high-tension continuous currents, with dynamotors or current transformers, which produce currents of low pressure for the network. The dynamos at the generating station produce the current at a pressure of 1,000 volts, and this is transformed down at the sub stations to a pressure of 100 volts. Fig. 3 is a plan of the part of the city in which the substations are placed, and the mains already laid along the streets are shown. The contractors for the whole work are the Electric Construction Corporation, of Wolverhampton, and it has been carried out under the supervision of Mr. Thomas Parker, the managing director. The building is a well built structure of brick, designed by Mr. Brevitt, of Wolverhampton, and the builders were Messrs. Kingerley, of Oxford. It is divided into two main sheds, separated by a brick wall. The engines and dynamos are placed in one part, and the boilers in the other, and all the plant is on the ground level. The engine room is thus kept perfectly free from coal dust. Three steel boilers of the locomotive type are at present installed; these were all built by Messrs. J. and H. McLaren, of Leeds; a Green's fuel economiser is placed in the main flue and a suitable by pass is arranged so that gases may pass direct to the chimney if needful. The engine room is well lighted from above. The steam pipes are arranged upon the ring system, so that in case of breakdown, as little as possible of the plant would be affected. Stop valves are placed between each two engines, and the bends are all of copper. Three engines are now put down, and these are of the inverted triple-expansion type, built by Messrs. J. and H. McLaron and Co. By the courtesy of the makers we are enabled to give the results of tests which were carried out at the works by Mr. Wilson Hartnell, Professor Goodman, and the inspecting engineer, Mr. Watson. The sizes of the cylinders are:- high-pressure, 9in. diameter, intermediate, 14·25in., low-pressure 22·5in. diameter, by 24in. stroke. Two trials were made, in one of which it will be observed the steam jackets were used, an in the other were not used. We may add that the high-pressure and intermediate cylinders are jacketted with steam at boiler pressure, and are drained through a McDougal steam trap into the hot well. The low-pressure cylinder is not jacketted. 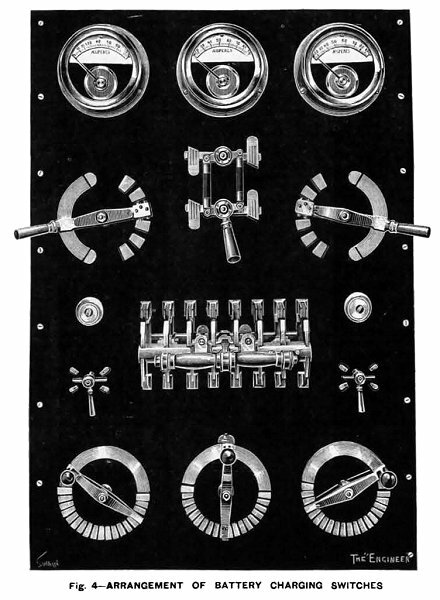 The McLaren automatic governor is placed inside the fly-wheel upon the shaft itself, and it works direct on to the high-pressure slide valve, which is not balanced in any way. The governor is self-locking, and is therefore not affected by any friction on the slide valve. The engines run very steadily, and all danger of the governor being put out of gear by the breaking of a belt is obviated. The surface condenser is fitted with brass tubes and tube plate; the tubes are ⅞in. outside diameter, and there is 382 square feet of cooling surface. The air pump is 11½in. diameter, the circulating pump 10in. diameter, and the feed pump 1¾in. diameter, all three having a stroke of 14in. The pumps are placed behind the condenser, and are worked by levers from the intermediate engine. The crank shaft is of forged steel, 5¼in. diameter, the crank pins 5½in. diameter, and the engines are thoroughly well finished. 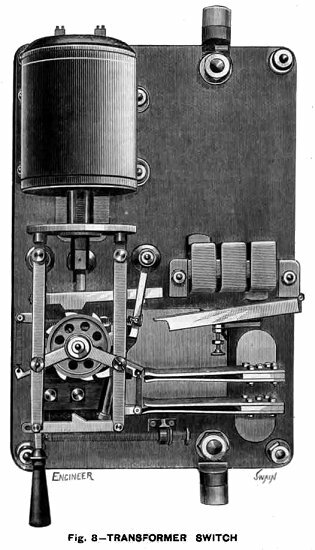 Each of the engines is provided with a heavy fly-wheel, and drives a dynamo by means of belting; two of the belts are of the usual double-sewn type, and the third is a Gaskin link belt. The three dynamos, one of which is shown in Fig. 4 are all similar, and were built by the Electric Construction Corporation; each develops 1,080 volts and 80 amperes, when running at 400 revolutions per minute. The dynamos are provided with an extra bearing outside the driving pulley, and each is excited by a small Elwell-Parker dynamo, driven from a rope pulley keyed on to the shaft of the main generator. The exciters give 135 volts, and can thus be used to charge the accumulators which are used for lighting the central station. The electro-motive force of the dynamos can be regulated from 1,100 volts at full load to 1,000 volts at light load, by means of resistances placed in circuit with the exciters. In the circuit of each dynamo is placed a double pole automatic cut-out, shown in Fig. 5 which protects the dynamo in the event of any excessive current, and is reset by hand, but it is so arranged that the cut-out cannot be held on. The dynamos are all connected in parallel to two common omnibus bars upon a switchboard at the works. The foundations for the engines are of a solid block of concrete, and that for the dynamos another solid block, weighing about 100 tons each, and about 11ft. deep. Air spaces are left round the blocks to diminish vibration. The switchboard at the works is very simple, and consists of three panels, each of which is similar to Fig. 5, and carries one ammeter for the high tension circuit, one for the exciter circuit and the knocking-off switch previously alluded to. Two overhead cranes, each capable of lifting six tons, are provided in the engine house, and a battery of fifty three E.P.S. cells is used for the lighting of the station. By means of this battery and of that at the chief sub-station, it is possible to shut down altogether at the works for six to eight hours in winter, and twelve to sixteen hours in summer. At the time of our visit, Mr. McLean, the engineer in charge, had placed a dynamotor in the works in order to light up about five arc lamps of fifteen amperes each, and 370 eight candle-power lamps. Current was also supplied for the electric cooking, which formed a feature of the dinner. From the generating station run out two pairs of heavily insulated Silvertown cables, each consisting of 37/14 copper wires; these are laid in cast iron pipes, and are carried a distance of about one mile to the distributing station at Broad Street marked No.1 on the plan, Fig. 3. The system of working is clearly shown in diagram-Fig. 6 which we published in a previous issue. It will be seen that the dynamos are coupled to two omnibus bars at the generating station, and thence run the high-tension mains to the central switch station, whence all the other sub-stations are controlled. At each of the stations, Nos. 1, 2, and 3 on the plan Fig. 3, is placed a dynamotor, such as shown in Fig. 7, which transforms the pressure from 1,000 volts to 110 volts, and gives out a current of 360 amperes when fully loaded. The efficiency of these machines is very high, being 92 percent when fully loaded, 89 percent at three quarters load, and 87 percent at half load. The main winding is a shunt to the low-tension side, and there are a few turns on the magnets in series with the high-tension armature. The oiling arrangements are very complete. The end of the armature shaft is provided with a cam, which actuates the piston of a small oil pump which feeds the bearing; the oil passes away through a filter to the oil reservoir, and is used over again. It is thus possible to run for some days without attention. The brushes upon the commutator are of copper gauze. An accumulator of 114 cells of the L. 31 E.P.S. type is installed here, and the cells are arranged in four groups, two of thirty-eight cells and two of nineteen cells. They are charged in three groups of thirty-eight cells each, and are discharged in two groups, each consisting of thirty-eight and nineteen cells in series, and are capable of supplying a current of 120 amperes for eight hours. Voltmeters are provided at the central switch station, which show the pressure at each of the sub-stations, and all the transformers can be controlled by one man. In starting a transformer the high-tension circuit is first closed through a resistance in order not to injure the armature windings. The dynamo field is then excited by a few coils in series. The dynamo part then begins to produce current, and the resistance is gradually taken out of the high-tension circuit. In order to put the transformer into circuit with the low pressure network, a special apparatus has been designed, shown in the diagram and also in Fig. 8; this instrument is placed at the sub-station and is designed for 400 amperes. It consists of a long-pull electro-magnet, which actuates a ratchet wheel and controls the switch. It is actuated by merely closing and opening a switch which short circuits the voltmeter on the pilot wire. One of the wires to the voltmeter is wound round the long-pull magnet, and the feeble current passing to the voltmeter under ordinary conditions is not sufficient to attract the armature, but by closing the switch the voltmeter is cut out of the circuit, and the long-pull magnet acts; the switch is then opened, the heavy armature drops, and the double movement causes the switch which connects the low-tension network to the transformer to close. In cases of accidental overloading, an automatic cut out-shown in Fig. 5 opens the circuit. The present capacity of the entire plant is 12,000 lamps of 32 watts, and 15,000 lamps could be wired. The low-tension mains were manufactured and laid by Callender's Bitumen Telegraph Company, under the superintendence of their engineer, Mr. W. Douglas Reid. Those cables are of two sizes, half a square inch and a quarter of a square inch section, and are of the lead-sheathed type, armoured with two layers of steel tape. These cables are simply laid in a trench under the footway, at a depth of about 18in. They are laid in lengths of from 150 to 200 yards, and are connected together in cast iron joint-boxes by means of copper connectors. The box is then run in solid with bitumenised wax compound. Disconnecting branch boxes are provided at different points in the network, so that any section or street can be cut out without in any way interrupting the supply to the rest of the network. House service wires are connected in T boxes by means of T copper connectors. These boxes and connectors are so made that the cable is not out, but is simply bared down to the copper strands and the connector put on and soldered. The box is then run in solid with the bitumenised wax compound. The small service wires are of two sizes, seven fourteenths and twelve fourteenths, lead sheathed and armoured. The arc cables are similar, but seven sixteenths. The whole installation is a very interesting example of the possibility of using high-tension continuous currents for large areas. High Tension Continuous Current Switchgear. The Electric Construction Corporation, Wolverhampton. The Engineer 31st March, 1893. 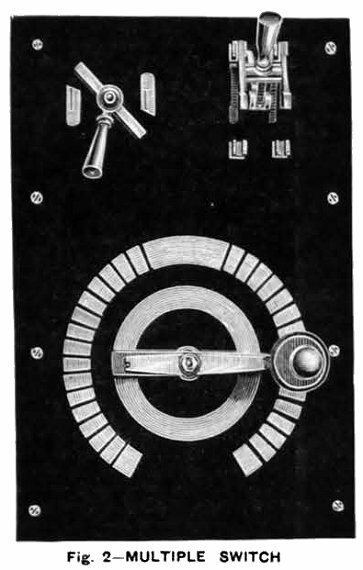 The switchgear illustrated by the accompanying engravings are those used by the Electric Construction Corporation, Wolverhampton, for their high tension continuous supply system, as used at Oxford, and at Sydenham. The system consists in supplying a system of distributing mains with current from a number of motor generators situated at sub-stations, these being supplied with current by high tension feeders run directly from switchboards at a central station. Each transformer has a separate feeder, and a pair of pilot wires also come back from each sub-station. The starting, stopping, and controlling of the motor generators is carried out from the central station. Fig. 1 represents a double-pole automatic magnetic cut-out and main switch, which is coupled on to the main omnibus bars at the central station, and from which feeders running between the transformers are connected. Fig. 2 represents a multiple contact switch for cutting resistance in or out of the high-tension feeder circuit. To start a transformer the multiple-contact switch - Fig. 2 - is turned over, so that all resistance is in circuit. The automatic cut-out- Fig. 1 - is then put on so that the high tension current passes to the motor generator at the sub-station. A few turns of thick wire wound round the magnets in series with the feeders gives the necessary magnetic field, enabling the motor generator to start. The secondary or low tension then gradually magnetises the motor generator field up to its full strength by a shunt across the low-tension armature. The starting resistance, which is connected to the right-hand side blocks of the multiple contact switch, Fig. 2 - is then taken out of circuit. 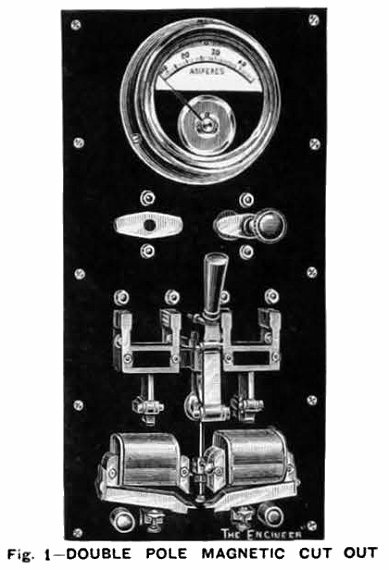 The small quick-break switch, shown at the top left hand corner -Fig. 2 - is then closed, which short circuits the pilot wires running back from sub-station, and one of these, wound round a pot magnet, actuates a special transformer switch, which connects the low-tension armature of the motor generator on to the distributing mains. This switch is then again broken, as only a momentary current is necessary, the switch being held in either an on or off position by springs. A voltmeter is connected across the pilot wires so as to indicate the electro-motive force on the network at the feeding point. The regulation of this electro-motive force is carried out by the left-hand blocks of the multiple-contact switch - Fig. 2 - cutting resistance in or out of the circuit. Fig. 3 represents a single-pole automatic magnetic cut-out, as is used at Oxford on the low tension of transformers, situated at the central station, where they can be reset by hand. These cut-outs break circuit in event of an excessive current being demanded by a short circuit on the mains. The magnet is compound-wound, so that in the event of one of the motor generators failing to give proper electro-motive force, the current passing back from the mains cuts out at a much smaller number of amperes, so as not to cause an excessive demand from any other motor generators that may be on the circuit, which is a thing that always happens where ordinary fuses are employed; any fault due to one machine failing to give its electro-motive force usually melting the fuses of other machines that may be connected in parallel on to the same circuit, owing to the large current required to cut out the machine that has failed. Fig. 4 represents an arrangement for charging a battery of accumulators from distributing mains. As these are kept at a constant electro-motive force, it is necessary to cut-up the battery into sections for charging. At Oxford there are 120 cells. These are charge in sets of 40 each, discharging in sets of 60 each. A throw-over switch in the centre of the board enables this alteration to be effected. Three multiple contact switches at the bottom of the board, and three ammeters at the top, are connected, one in each of the three series when charging. Two multiple contact switches enable the number of cells in the discharging circuit to be regulated, and a double-pole switch is provided for cutting off the accumulators entirely. The two-way switches are provided for connecting the voltmeter across one or other of the batteries. Within four years the new company found itself in deep trouble and was voluntarily wound up in July, 1893. It seems that there was a lot of dissension amongst the Board of Directors, one of whom was later convicted of fraud. It was immediately reconstituted as the Electric Construction Company under the chairmanship of Sir Daniel Cooper. The E.C.C. works in about 1902. The Financial Times of 6th July, 1893 mentions that the debenture holders and shareholders agreed to reconstruct the Electric Construction Corporation into the Electric Construction Company. The capital will be written-down from £879,260 to £650,000 as the assets are now considered to be less than was previously stated. The ordinary shareholders will receive two £2 fully paid shares in the new company for each fully-paid £10 share in the old Corporation. Preference shareholders will receive five fully paid, seven percent, cumulative preference shares of £2 each (£10), for each £10 fully-paid seven percent cumulative preference share, of the Corporation. Holders of Founder’s shares are to receive two £2 fully paid ordinary shares in the new company, for each £10 Founder’s share in the Corporation. It will be seen that the heaviest loss falls on the ordinary shareholders, but the apparent loss of capital makes no real difference, because the £10 shares are barely re-saleable at 30s. The E.C.C. dynamo at Cragside. It is pure Thomas Parker, looking just like an Elwell-Parker product. Courtesy of Robin Wright, Engineering Warden, Cragside. The Electrical Power Storage Company, one of the founder members of the Corporation was originally purchased for £150,000 and later sold to the Foreign and Colonial Power Storage Company for £75,000 in shares. Sir Daniel Cooper was greatly disliked by Thomas Parker and five of his senior staff from Elwell-Parker. They all resigned within a year of Cooper's chairmanship, and at the first A.G.M. in September, he referred to Thomas Parker in such a way that suggested that there was no love lost between them. Thomas Parker himself referred to the directors as "all that coterie, about whom the less said the better". We understand that a new company will be promoted with Mr. Parker as one of its members, for the carrying out of works of a similar character in this district, which will be of such dimensions as will add considerably to the manufacturing interest of the neighbourhood. Mr. Thomas Parker, M.Inst.C.E., who designed and carried out the electrical plant and motors of the Liverpool Overhead Railway, has resigned his position as works director to the Electrical Construction Company, Ltd. Mr. Parker had entire charge of the works at Wolverhampton since the formation of the Electrical Construction Company. He has registered a new Company - Thomas Parker, Limited, and has secured a very fine site for his works at Wolverhampton. We are informed that Mr. A. B. Blackburn, M.lnst.C.E. 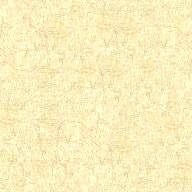 (lately with Messrs. Mather and Platt Ltd.), has been appointed to the position vacated by Mr. Parker.